The cake itself looks already very good and the caramel icing makes it even more tempting! Angie, thank you! Of course, I really miss eating it in my grandma's little kitchen! I'll tell him right now! 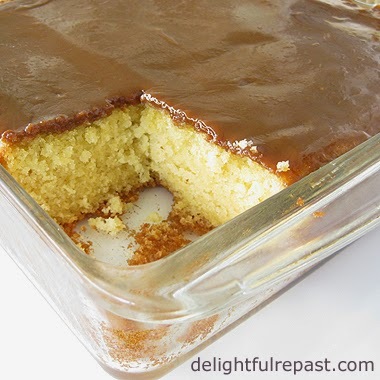 And you can march right into the kitchen and whip up a little pan of the caramel! Oh yumminess! This cake looks so moist and fresh! Great recipe - thanks for linking! Bernideen, thank you. My number one consideration with all things I bake is how well it goes with a cup of tea! That looks delicious, Jean. My aunt used to make a similar cake with boiled chocolate frosting, which we kids would peel off, roll up, and eat before we ate our cake. :-)) The caramel topping would be great too! Martha, thank you. I love telling a little about my grandmothers in my blog! Thanks, Judy! I'm going to look into that "peelable/rollable" boiled chocolate frosting--it's a new one on me! Amy, I do too! Yet until I was about 25, I preferred chocolate. Not any more! 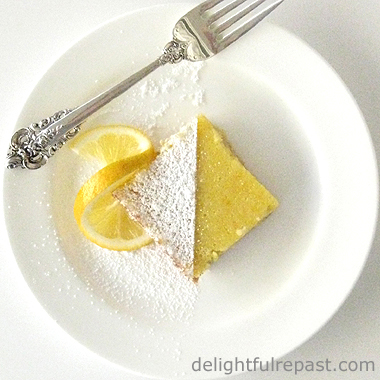 Yes please, I'd love a slice of Grandma's recipe for yellow cake! That would be the perfect ending for me this evening, Jean. Kitty, thank you! Wish I had a piece right now myself! I want some of this with a glass of cold, creamy milk to go with! Elsie, that *does* sound good! I can't think of the last time I had a glass of milk with cake, but I just might do that next time. Your cake looks delightful, especially frosted with caramel! My grandmother had a huge kitchen with a pantry off that. But then she had a big house. She was quite the cook and there was always something delicious cooking or baking in her kitchen. So many lovely memories! Thanks for sharing. Sandi, thanks for sharing lovely memories of your grandmother. I love grandmother stories! Looks delicious, I need to try it just for icing, Grandma are always best cooks Jean. This is one is really tempting. Swathi, thank you. I hope you like it as much as we do! Oh my, this cake looks divine! Thank you SO much for sharing the delicious recipe, my friend :) And how precious that it's your sweet grandmother's recipe. Thank you for the lovely visit to my blog - your comments are always a joy. Hugs! I love simple cakes. They are not as intimidating yet a wonderful treat. I love the comparison to the "LBD". Thanks for sharing.... Have a wonderful weekend! Bonnie, you're the first person to comment on the "LBD"! Thank you! Grandma's recipes are the best! I have a molasses cookie recipe from my grandmother that I treasure. Thanks for this one! Thanks, Kate! I'll check that out. OMGosh Jan - this looks absolutely amazing. My mouth watered when I saw it. It looks so moist and addictive! Kristi, thank you! Yes, it probably is addictive -- why can't I get addicted to something like poached fish! 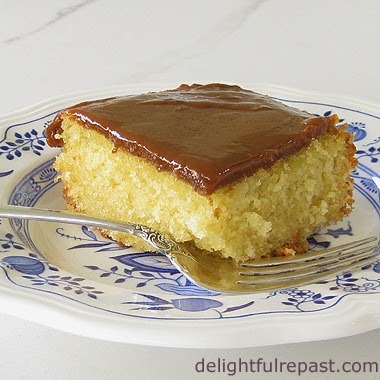 Yellow cake with caramel icing sounds perfect to me. I love that this is your grandmother's "little black dress" of cakes! Bianca, thank you! Glad you liked that. Funny thing, neither of my grandmothers were "LBD" women (but I am)! I love how you describe this cake as the "little black dress of cakes". It's so deliciously versatile with the different icings - I would definitely try to caramel first as well! The cake looks so tender and lovely. Isn't it amazing how some of our grandmas made do with so much less and yet it never seemed to hold them back?! Thank you for sharing with us at the Hearth and Soul hop. Pinned and will tweet! Thank you, April! AND thank you for pinning and tweeting - much appreciated. Greg, I do *try* to live simply -- and in many ways I succeed -- but kitchen stuff seems to be my weakness! What a delightful cake, it looks delicious! Hope you are having a great week and thanks so much for sharing with Full Plate Thursday. Thanks, Miz Helen! Hope you have a great week! My grandmother had a tiny kitchen too, minimal gadgets, and put out meals and baked goods like nobody's business. I miss the conventional ways of yesteryear, but a treasured recipe like this keeps the memory close by. Thank you so much, Brooks! Wouldn't your grandmother be dazzled by your new kitchen! Margot, thank you. Yes, they are!